The chilli and lemon rub gives the steak a really gutsy flavour and wonderful crust when cooked. Preheat the oven to 200°C, gas mark 6. Place the lemon rind, garlic and cumin seeds in a pestle and mortar, grind well. Stir in the chilli powder, sea salt and oregano, until mixed well. Rub mixture into the steaks, cover and leave in the fridge on the bottom shelf for 30 minutes. Mix together the couscous, oil, lemon juice and flat leaf parsley. Season well. Halve the tomatoes and place on a baking tray. Sprinkle with the couscous mixture, roast for 15-20 minutes until the tomatoes are tender and the topping is crunchy and golden. To cook the steaks, heat the sunflower oil in a frying pan and cook for 3-4 minutes each side or until done to your liking. Remove from the pan and leave to rest for 4-5 minutes. 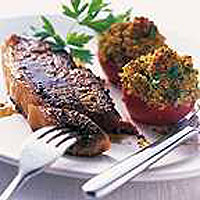 Serve the steaks with the crunchy topped tomatoes and boiled new potatoes. This recipe was first published in November 2000.